This fall, Horrid Henry – the original British bad boy – is back with four more terribly funny tales that will delight beginning readers. Horrid Henry is up to his usual tricks - teasing his brother Perfect Peter, antagonizing his neighbor Moody Margaret, irritating his teacher Miss Battle-Axe, and manipulating his parents – in Horrid Henry Wakes the Dead (Sourcebooks Jabberwocky, ISBN 9781402259340, August 2011, Ages 7-10). 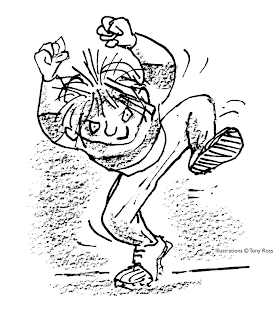 Prankster and anti-hero Horrid Henry attracts trouble as surely as honey attracts flies. Just like Bart Simpson, Bugs Bunny or Tom Sawyer, young readers are attracted to Horrid Henry’s lively personality, outrageous schemes, and hilarious antics that sometimes end in disaster – for Henry or for his not-so-innocent dupes, like his brother, Perfect Peter. Francesca Simon was born in the United States and attended both Yale and Oxford universities. For ten years she worked as a freelance journalist. She now writes full time and has had many books published, including the bestselling Horrid Henry series and several picture books. She lives in North London, England, with her husband, Martin, and her son, Josh. 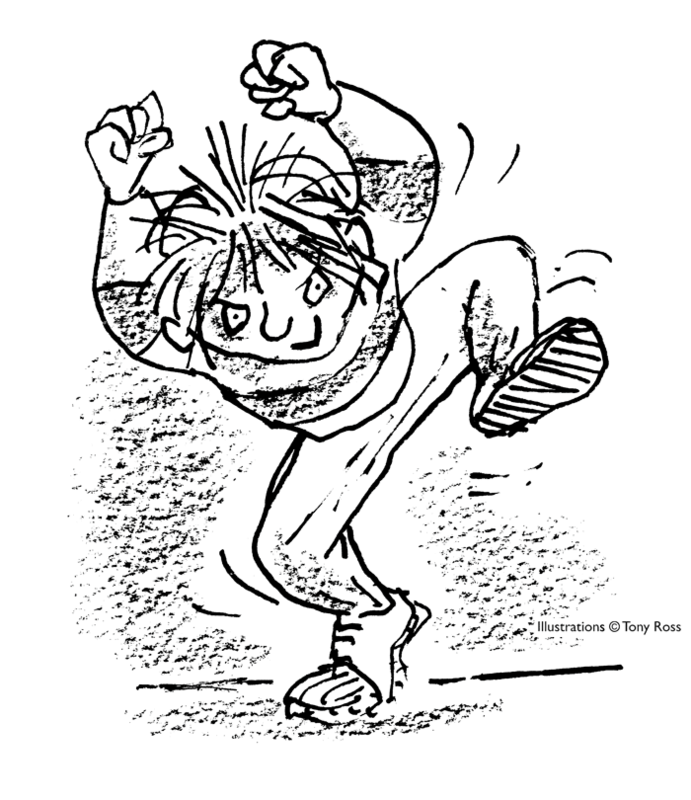 Tony Ross is a prolific illustrator of books for children, including Francesca Simon’s Horrid Henry series, Martyn Beardsley’s Sir Gadabout stories, and, of course, his own stories. Tony has become one of the best-known creators of original and traditional picture books, and his work has been sold all over the world. There are four stories in this book. One of them is HORRID HENRY WAKES THE DEAD, the other three are HORRID HENRY AND THE TV REMOTE CONTROL, HORRID HENRY'S BAD PRESENT, and HORRID HENRY'S SCHOOL ELECTION. Henry is a loveable bad boy. The stories about Henry will make you laugh out loud. 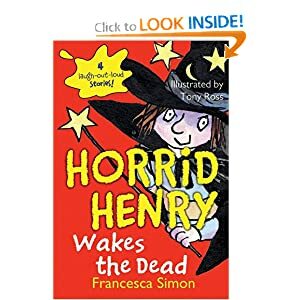 Your children will want to hear all these stories and maybe look into the other books about Horrid Henry that Francesca Simon wrote. Henry and Margaret wanted to become class president. Of course only one of them could win. They campaigned with posters, promises,speeches and often nasty tactics to try to convince their peers to vote for them. Henry won the election. He thought he would be able to make decisions which included more fun and foods the students would enjoy and get rid of the "adult" ideas . However the first school council meeting was a shock to Henry. The principal, Mrs. Oddbod, told Henry he was now in charge of organizing the bathroom rotation and the litter cleanup during playtime. This was not what Henry expected nor wanted and he promptly resigned! The school Henry attended was having a talent contest and each child had a opportunity to choose a talent to perform at the show. After much thought Henry decided to perform magic and with the help of Peter,his friend, he would raise a skeleton out of a coffin. So Henry make a coffin and painted it. Peter has a costume and would use a skeleton hand and head during the magic show. Henry had an elaborate costume and practiced his magic words until he could say them perfectly. On the day of the performance, Peter assisted him with showing the skeleton hand and head and making an awful wailing sound which frightened some of the audience. When the winner was announced, Henry thought he has won, but it was Peter who won the performance as the skeleton in the coffin. What a surprise for Henry and he was , of course, not happy! In all these stories you get the picture of the cantankerous Henry getting himself into even more trouble. If you have enjoyed the series in the past you will love this book!